For our purposes, an apostate is someone who wants to ruin a Witness’ chances of everlasting life by filling his head with poisonous lies. By lies, I mean anything that Watchtower leaders disagree with. This is probably the most difficult route to take, but in many cases, it can yield the best results if you play your cards right. A good apostate – the kind that should be avoided instead of helped to see the error of his ways – is kind of a know it all. He’s proud, assertive, and even a little offensive. The ideal apostate is also intellectually intimidating because he knows the Bible as well as any Jehovah’s Witness and can debate circles around them. For most Witnesses, saving him from his evil ways is pointless because his heart has hardened itself to “the truth” (the teachings of Jehovah’s Witnesses) so he cannot be saved. Since Witnesses have nothing to gain by arguing with him and have everything to lose if he sews the seed of doubt in their hearts, the scary apostate should be avoided. If you decide to go this route, then you must be defiant and impossible to reason with, but you must not appear to be a laughable buffoon, either. An idiot-apostate is just entertainment for most Jehovah’s Witnesses. On the other hand, an apostate determined to prove how right he is will only frustrate and confound them. If you succeed in being a good apostate, rumors will spread that your home should be avoided by other Witnesses at the Kingdom Hall. If you’re very successful, their elders may even declare your home off limits. Achievement unlocked! You should, of course, know a thing or two about the teachings of Jehovah’s Witnesses if you really want to pull this one off. My articles at Atheist Geek News will be of some help. You might want to do some reading here and here for other articles I’ve written at Michigan Skeptics. Please note that you should not actually refer to yourself as an apostate when talking to one of Jehovah’s Witnesses. That would be too obvious. It will also lead to other questions or inquiries you’ll never be able to answer unless you really are a former Jehovah’s Witness. Like me! So unless you have it on good authority that local Witnesses really will avoid you if you simply declare yourself to be an apostate, don’t go there. If you don’t have what it takes to be a good apostate, you can try going on the offensive by making them feel so uncomfortable that they don’t ever want to come back. Remember the real point of this one is to challenge their claim that they have the one, true religion that everyone should want to join. They may try to dismiss these topics, but you must make it clear that they matter a great deal to you. The fact that you’re asking them to defend their organization against perfectly valid complaints will matter to them as well. Evolution. More on that here, and here. (Check the comments, too!) If evolution isn’t your strong suit, you can also use other topics that the Society has written about and gotten very, very wrong. Charges of pedophilia by elders, or other Witnesses, that were not reported to authorities by congregation elders. More here. Their many failed predictions about the end of the world. Don’t let them off the hook when they tell you that these predictions didn’t happen or that the lives of many Jehovah’s Witnesses weren’t devastated when the predictions failed. The obvious manipulation of the parents (and the video’s creators) in the infamous Sparlock video. It was so bad that many Witnesses thought the video was a fake when it first came out, too. The plight of ex-Witnesses who have been shunned by their own families, as shown in testimonies across the web and the Truth be Told documentary. What some see as the cult-like behavior of the Watchtower Society and it’s leaders. Their low retention rate, both for those converted and those “born in” (raised to be Jehovah’s Witnesses by their parents). Ask them why their retention rates are so low if God is really on their side or ask them why people keep leaving if life as one of Jehovah’s Witnesses is really an improvement over your life as it is now. The rationale for refusing blood transfusions and the fate of those who have refused necessary transfusions due to this teaching, including children with Witness parents. NOTE: If you have the Web of Trust plugin on your computer, it may red flag a couple of the links above. This is not because they contain harmful software. Jehovah’s Witnesses can vote at Web of Trust the same as you and I. Many have understandably chosen to vote these sites down to stop people from visiting them. These sites will not harm your computer in any way, however. If you play your cards right, they’ll go ahead and label you an evil opposer for giving them a hard time and add you to their Do Not Call List. Let me tell you the problem with this one right away: in most cases, it will only keep them at bay for about six months. That’s the policy as I understand it, and even then, many Kingdom Halls don’t follow it. Some have congregations have an entirely different policy of their own. Still, if you live in a neighborhood where Jehovah’s Witnesses visit so often that it borders on harassment (yes, such places do exist) then this sure beats having them drop by every morning. When asking Jehovah’s Witnesses to stop calling on you, try being forceful but respectful. Be prepared with an answer when they ask you why you don’t want them to bother you anymore. They will probably try to talk you out of it, but be sure to stick to your guns and stay on topic. Note that confidence will work better than meekness in this situation, and don’t get angry with them unless they get angry with you. But make sure they know you’re serious about this request. Then ask them – point blank – if they intend to honor it. If they say no, tell them you’re prepared to complain to the congregation overseer or that they’ve left you no choice but to complain to the police. In some neighborhoods, a call to the Kingdom Hall will actually get you routed to the congregation overseer, also known as a Presiding Overseer, unless you happen to call during meeting hours. Either way, you should ask to speak with an elder or the Presiding Overseer. Then make your case to him directly. This may have some impact if the elders at that congregation are especially moderate, or if you have legal grounds – such as being visited so frequently that you’re ready to pull your hair out or to call the cops on them for harassment. (See suggestions #5 below.) If the Witnesses who have arrived at your home were rude, inconsiderate, or otherwise not very nice, you could try explaining this to the overseer and citing it as one of the reasons you don’t appreciate their visits. You could mention other reasons as well, like accidental damage to your property. For instance, there were several cases at my former Kingdom Hall where Witnesses actually ran over someone’s dog by mistake! I know of one case where the Witnesses held open the householder’s door to prevent him from closing it on them, only to have the householder’s pet bird fly away! These are not the sort of experiences Jehovah’s Witnesses want to be known for, and they might be enough to persuade the overseer to spare your house from further visitations. You could also tell him that you have pets that might injure the Witnesses, such as an aggressive dog, and you frankly don’t want to deal with a lawsuit if a Witness gets bitten. Once you’ve made your case, make sure to ask the overseer if he intends to honor your request or not. If he refuses to make any promises, make sure to let the overseer know what you’re prepared to do if anymore Witnesses come knocking. Please do not threaten him or any Jehovah’s Witnesses with any form of violence. Yelling and screaming probably won’t help, either. But you can threaten to take your case to the authorities or even take legal action by contacting a lawyer if he seems unwilling to mark you as a Do Not Call. As a last ditch effort, you can try calling the police if Jehovah’s Witnesses are calling on you far too often. There are rules in different countries and in different states that could justify making your home off limits to the entire congregation if they won’t leave you be. If nothing else, a phone call to the police will let you know where you stand and what’s required for the authorities to get involved. 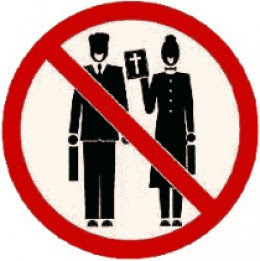 Be forewarned that some Jehovah’s Witnesses might visit you anyway just to prove to Jehovah God that they aren’t afraid of defying local authorities in his service. But you can still let the police know about it if they do. Be sure to get the Witness’ name as well. If there’s a fine for this sort of thing, the congregation elders won’t like making a cash pay out. That might be enough to get the elders to enforce your request. Will Any Of These Suggestions Guarantee Success? An old but infamous photo. Sadly, no. It all depends on your local congregation and the elders. As I have stated several times already, all Kingdom Halls are not alike. Things that work at one Kingdom Hall won’t guarantee success at any other. Note that some Witnesses are genuinely proud to be known for visiting people who’d rather be left alone. They see it as giving us a chance for everlasting life whether we want it or not. We may feel that we’re entitled to be left alone, but they feel that we’re entitled to know about life everlasting on a paradise Earth. Many Witnesses also feel that it is their duty to preach to others, not only for our sakes, but for their own. They want to earn their way into paradise too, and evangelizing is one of their principle ways of getting there. Do we really? Well, I don’t think the witnessing work should be made illegal. I’m all for free speech. But I certainly think the rest of us have the right to be left alone if that’s what we want, too. Either way, if you have any real suggestions you’d like to share with us, feel free to leave them in the comments below. Just remember, if you’re a former Jehovah’s Witness or currently a Jehovah’s Witness, Kingdom Halls do vary quite a lot. If your Hall handles these requests differently than the ones I’m familiar with, let us know with some suggestions below. If I have the time, I prefer to mess with them – to lead them down unfamiliar paths and try to make a brain cell or two fire. I’ve actually had made their hands shake as they flip through their bible. As I have said in this article and many others, no 2 congregations are alike. The same goes for JWs. Some methods will work sometimes, others at other times. Why do you want to promote prejudice, and where will it stop? If a black neighbor knocks on your door will you tell him to go away because you are white? There is no reason to fear these people, what harm can there be in simply being courteous and allowing their occasional visit? If you are not confident in your personal belief system, it may be time to reexamine it. Instead these “suggestions” encourage people to ignore strangers, or treat others as lesser people, not worthy of a few minutes of your time. So sad. Are you saying that it’s prejudice to not want to be witnessed. Is it prejudiced to want to be left alone. Is it my duty to listen to the same argument over and over? 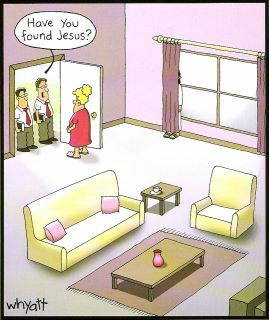 As you are a Jehovah’s Witness yourself, perhaps you could answer a question for me. Why wont you respect the rights of people that just want to be left alone? Why over and over must you knock on my door and harass me? If I ask you to stop and you don’t, yes, that is harassment. 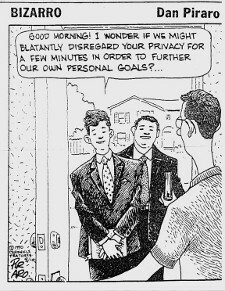 It’s not prejudice to not want the Jehovah’s Witness at your door. I don’t hate you or think less of you. I want you to stop trying to “save” me from something I don’t think even exists. Adam, my questions remain. What possibly do you and others have to fear by simply practicing common courtesy? There has to be something you/they are afraid or ashamed of that brings out this negative reaction to fellow humans. Common courtesy? Like the common courtesy of getting people to drastically change their lifestyle in order to join a cult? The common courtesy you show anyone who changes their minds (grows a brain)and rejects your beliefs? You’ll do the common courtesy of having all their friends and family shun them, forever – refusing to speak to them, making them as miserable as possible. That kind of common courtesy? The common courtesy of taking a doctors advice when he says your child needs a blood transfusion to live, as opposed to your common courtesy of letting your own child *die*? That kind of common courtesy? That is a good question. What do you have to fear by leaving someone be? By showing the common courtesy of leaving someone alone? Your question does not remain. I have asked Jehovah’s Witness to stop visiting me. They have ignored this request. Where is the courtesy in that? Are you saying that I have to sit down and talk with them every time they visit? Unfortunately, I have found the attitudes expressed here by Ken to be fairly common among JWs and other evangelists. They often express a desire to be treated with greater courtesy by those they visit, lament the fact that they are only doing what they believe is right and that others should therefore let them do whatever they want to them as potential converts, express a desire to be allowed to treat potential converts any way they like, etc. They often use terms like respect and courtesy to describe the behaviors they want from others because this sounds like a good, reasonable thing. But what they really are describing is total deference. Worse, many evangelists fail to return respect or courtesy to those they visit. This isn’t about hating JWs, though it probably makes it easier to rationalize the lack of welcome they receive from householders when they perceive it this way. longest lasting impression. Note that JWs aren’t the only evangelists who suffer from this sort of attitude, but they are the ones I know the most about as I used to be one. I daresay your comments here haven’t done anything to change anyone’s mind about this, either. This is not the sort of behavior that draws in converts. It pushes us away. Maybe that’s something worth thinking about, especially if making converts is supposed to be a top priority for JWs who want to make it into a paradise Earth. I contend that JWs who behave badly when preaching to others are more absorbed with their own goals than they are with selflessly saving others as they claim. Ken, we would have been far more impressed with your example if you had asked us why we want to be left alone instead of opening up with accusations of hate and prejudice. You are not making a very good impression and are actually reinforcing the need for articles like this one. First, let me apologize if the way I worded my original, or subsequent posts was offensive. It was most certainly not intended to be. What I began to address was the issue of why a person allows his dislike of someone knocking at his door to fester inside and make them act in a negative way. Frankly, after close to 60 years in this ministry, I find this growing animosity to our calls to be most pronounced in the religionists, especially those claiming to be Christian, than in Atheists, Agnostics or skeptics that I meet. In fact, the vast majority of those who do not want to talk to me say so in a kind manner, and do not resort to deception or unkindness in doing so. As a guest in your internet “home” I specifically avoided, even when someone tried to provoke me, discussing or explaining my religious views since you made it clear you did not like that. I continue in that vein. My first post was a concern that persons who feel the need to resort to the ruses proposed would prefer to act in that manner instead of simply saying to the caller “I do not wish to speak with you” or the like. In this way, you honor your fellow man’s right and desire to call, while avoiding the discussions that seem to bring you angst. But instead, to allow this activity to make you mad is not good for you psychologically, mentally or physically. This bitterness is simply not in people’s best interest, and as a fellow human I expressed concern. That is what I was addressing, and again I apologize for not stating it more succinctly. Ken, the reason people actively seek advice in stopping these visits is because – in the vast majority of cases – simply asking the Witnesses at your door to stop this or any future visits does not yield the desired result. In most cases, the Witnesses will become incensed, take offense, and proceed to behave in a manner that causes so many people to dread visits from evangelists of all stripes in the first place. Hence, people look for other ways to deal with the issue. On a related note, when I first decided to leave my KH to sort out my feelings about the Society’s “truth,” I was mercilessly harassed by local Witnesses. I continue to have problems with them to this day, though I would no longer characterize their occasional interventions as harassment. But it was their bad behavior that pushed me to do research on the Society, it’s teachings, and JWs. That, in turn, led me away from them and, over a period of years, toward atheism. Do JWs a favor: spread the word that bad behavior does not make more JWs. It makes more apostates, opposers, XJWs, and increases resistance to the spread of the teachings of JWs. They are hurting their cause, not helping it. Thank you for apology as well. Let me take my leave by quickly violating my word not to bring religion into your “home”. I have no reason to doubt or deny your observations. I was a young man when my rose colored glasses (as to my brothers) first went clear. I also have a son who has similar experiences and feelings as you, though he still believes there is a God. I have no doubt that I have myself, along the way, not been as kind or considerate at the door as I should have been, and I KNOW I have been guilty of harming my brothers’ feelings. I have tried to forgive myself, as I have asked for their and God’s forgiveness. But I leave you with what I tell my son and others who express similar feelings against our religion. Every person that has harmed or hurt you has harmed or hurt themselves. But it was NEVER Jehovah who did it. And until I can see His Spirit on some other organization, I will remain ever loyal to its imperfect oversight and members as it and they have to me and all my faults. Never forget, Ken, that I do not believe in Jehovah’s existence. So I do not blame him, or credit him, for anything at all. Nor do I blame all JWs for the actions of those who have done more harm to their cause than good. For the record, I do think that the culture of JWs works against them in many areas, including the issue of how to convert others respectfully and in working with others (non-Witnesses) and learning from them instead of fearfully treating them with suspicion or as being a source of potential corruption. Don’t even get me started on how ex-JWs like myself are seen. Nevertheless, when JWs act badly, those JWs deserve the blame. When they act well, those JWs deserve the credit, too. this is simple. there is a public property and private property. if you are trespassing on the private property while seeing NO TRESPASSING sign, you are asking for being removed by force, as you have decided to ignore the sign and carry on towards my home. if police can’t help me, i will help myself. period. i have two large signs in a clear view prohibiting Witnesses from entering my property. they do not care. why exactly should i care about their twisted feelings and continue politely asking them to let me be? why should i waste my precious time on making special signs when NO TRESPASSING/NO SOLICITING sign says it all? no, i will not take lightly some pricks bothering me, making my dog bark its lungs out and etc…everything must have a limit. how can i possibly have any sympathy towards Jehovah’s Witnesses, if they have no respect for me, my time, and my property? Two problems worth mentioning are that 1) unless you know something I don’t, no trespassing signs do not apply – legally – to the activities of JWs. They certainly don’t apply to them where I live, though I know many local towns have tried to make it stick to them only to be shot down later. And 2) JWs don’t care. Worse than that, it encourages them. To be honest, I really think you should be able to post a sign and not be bothered by JWs, Mormons, life insurance salesmen, girl scouts, and so forth. But in the case of JWs, it is a badge of honor to knock on a door where they know they are unwelcome. If it’s against the law and they risk being thrown in jail, so much the better. 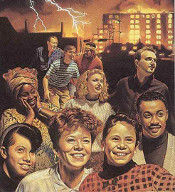 Preaching in the face of adversity is as close to sainthood as JWs get these days, I’m afraid. Being an anointed isn’t even as big a deal as it used to be. But getting tossed in jail for their beliefs is. And a No Trespassing sign is a challenge that many of them will accept. In fact, they’ll probably feel good about themselves afterward. They’ll be the talk of the KH for weeks if that happened. And more would surely follow. I agree that this is disrespectful of them. I was harassed by JWs for several years when I stopped going to meetings myself. I just don’t think it will work the way you believe it should, unfortunately. As to removing JWs by force, that’s another subject entirely. The First Get Together of 2013!